Atlanta There are 3 products. 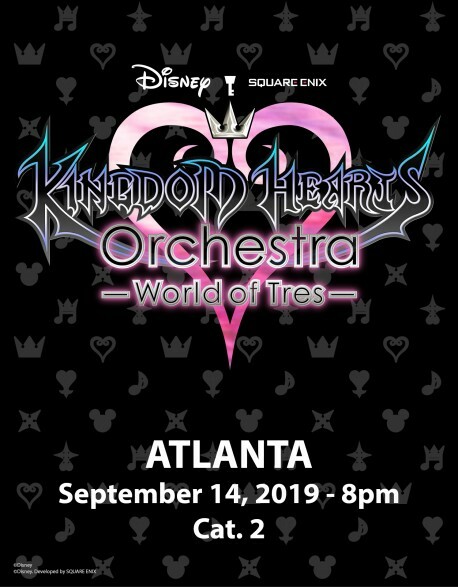 Assigned seat in Categoy 1 Area for KINGDOM HEARTS Orchestra -World of Tres-, on Saturday September 14, 2019 at 8pm at Fox Theatre (Atlanta/USA). Pre-sale - Estimated dispatch of tickets : March 15-30, 2019 Price include a 4 USD Facility Fee. Assigned seat in Categoy 2 Area for KINGDOM HEARTS Orchestra -World of Tres-, on Saturday September 14, 2019 at 8pm at Fox Theatre (Atlanta/USA). Pre-sale - Estimated dispatch of tickets : March 15-30, 2019 Price include a 4 USD Facility Fee. Assigned seat in Categoy 3 Area for KINGDOM HEARTS Orchestra -World of Tres-, on Saturday September 14, 2019 at 8pm at Fox Theatre (Atlanta/USA). Pre-sale - Estimated dispatch of tickets : March 15-30, 2019 Price include a 4 USD Facility Fee.